A teenager complained unhappily to her grandmother that one of her friends was, "So lucky." The wise older woman dryly replied, "Child, in this life you make your good luck and you make your bad luck." The teenager could not recognize the Wisdom that had been laid at her feet. "Wisdom is the principal thing; therefore get wisdom: and with all thy getting get understanding (Proverbs 4:7)." Rev. Ike's Science of Living philosophy puts the responsibility for what happens in your life squarely on your shoulders—or more specifically on the result of the thoughts you entertain each day. "For as he thinketh in his heart, so is he… (Proverbs 23:7)." Rev. Ike teaches that Life is lived according to Universal Law. 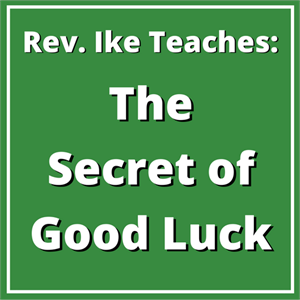 In this series, he teaches you how to determine your luck based on Wisdom and knowledge. "I am the master of my fate; I am the captain of my soul." Therefore, when Life presents you with its menu and asks "What would you like?" do you know? If you dont, you are operating from dumb luck instead of the Science of Life. Learn the science behind unanswered prayer versus answered prayer. Lesson 3: Dumb Luck or Science: Which am I going to live by? "And the lord answered me and said, 'Write the vision, make it plain…' (Habakkuk 2:2)" Write your dream and your goals; make them plain. But first, you must answer the question, "What do I want?" "Judge not, that ye be not judged. (Matthew 7:1)" The judgments that you make about other people and things will confront you in and as your own experience. Total length: 2 hours 34 minutes.